Enriqueta Augustina Rylands conceived and paid for the building and stocking of the John Rylands Library in Deansgate, Manchester as a memorial to her husband, and it still stands his memorial today long after his business activities are forgotten. The plaster model, frontispiece to Vol.1-7 of the Bulletin of the John Rylands Library. Enriqueta Augustina Tennant was born in Cuba, along with her twin brother José Estaban Tennant (later known as Stephen) on 31 May 1843 into a family of wealthy sugar growers. As a child she lived in Cuba, England, France and America. Soon after the family moved to England in 1848, her father, Stephen Cattley Tennant, was killed when he fell under a moving train at Farnborough station. Her mother moved to Paris where she married a Polish pianist and friend of Chopin, Jules Fontana (1810–1869); she died suddenly in 1855. Enriqueta Tennant attended a convent school in New York and finishing schools in London and Paris. In the early 1860s Miss Tennant became the companion of Martha, the second wife of John Rylands, and cared for her until her death on 13 February 1875. 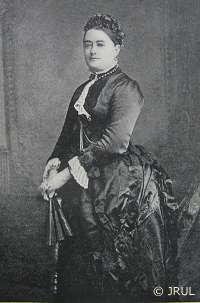 On 6 October 1875 Enriqueta married John Rylands. They had no children of their own, but adopted a son and a daughter. John Rylands died on 11 December 1888, leaving a huge some in money and company shares, and Enriqueta resolved to create a library in Manchester as a memorial. The following year Basil Champneys was appointed as architect, and on 6 October 1899 (John and Enriqueta's wedding anniversary) it was ready for its opening ceremony, though general readers were not admitted until 1 January 1900. The library took ten years instead of the original estimate of three to complete, and also cost three times as much as the original estimate, £224,086 (at leat £50 million in modern terms) against £78,000. Since then, there have been several extensions to the building, most recently in 2007. The bronze statue welcomes visitors to the ground floor café and shop, October 2015. Theology directing the labours of Science and Art. For a Cassidy work once owned by Mrs Rylands, see our feature on Sir Charles Hallé. 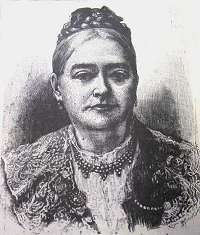 Elizabeth Gow: Enriqueta Rylands, who do you think she was. Booklet accompanying an exhibition at the Library, 2008. 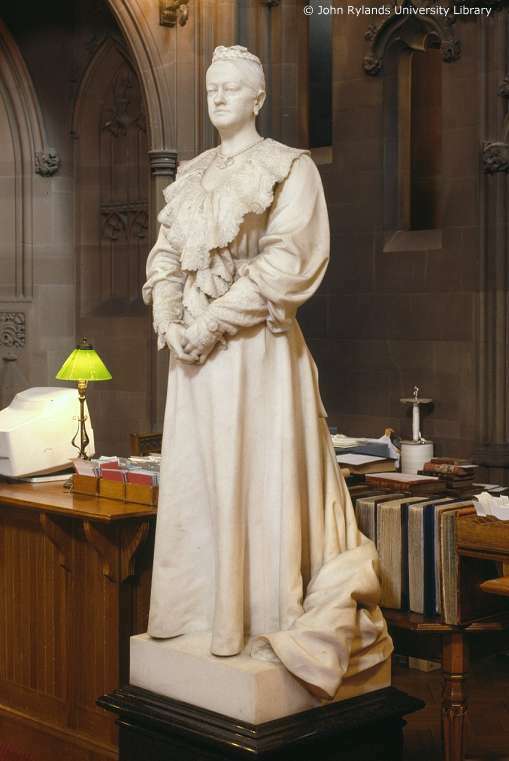 Cassidy created two matching statues, in white Saravezza marble, of John Rylands and Mrs Rylands, which stand guard over the two ends of the Library's Historic Reading Room. John Rylands (1801 - 1888) occupies a prominent position at one end, and Mrs Rylands presides over the other, near to what used to be the Library's service counter. The picture above dates from 2003. Although the statues appear as a pair, they were not conceived or commissioned together. 'John Rylands' was commissioned by Mrs Rylands in 1894 as an integral part of the library dedicated to her late husband, and has had pride of place since the building opened in 1900, whilst her own likeness was commissioned by supporters of the Library, and unveiled on 9 December 1907, a few months before her death on 4 February 1908. According to Stephen Tennant, Mrs Rylands' brother, the Governors of the library, feeling the need for something of a 'personal nature' to connect the library with its founder, explored the possibility of commissioning a portrait of Mrs Rylands. However, Mrs Rylands suggested a statue instead from John Cassidy, whose work she had chosen some years before for the library interior. Cassidy supplied a plaster model for approval, and a photograph of this (reproduced in the left column) was printed as frontispiece to the first bound volume of the Library's Bulletin. These two statues are the only large works Cassidy was given chance to produce in marble, and on this one he, and the marble-carver who assisted him, were able to show their skill with the lace-work on Mrs Rylands' dress, which he had previously applied to the Queen Victoria statue in Belfast. 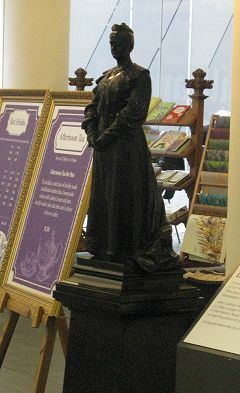 Over the years, many visitors to the Library have reportedly believed Mrs Rylands' statue to portray the late Queen. A bronze version of the work, approximately one metre high plus the plinth, was also made, probably cast from the original plaster model. After a long sojourn in the main University Library on Oxford Road, with which the John Rylands Library merged in 1972. It was located inside the entrance to the Muriel Stott Conference Centre, added to the building in the late 1970s following a bequest by Miss Stott, daughter of an Oldham cotton spinner. Many users of the Centre probably assumed that it was a statue of Muriel Stott. On the opening of the major new extension to the Deansgate building in 2007, it returned there, and was displayed outside the new reading room on the top floor where it was rarely seen by members of the general public. In 2015 it was given good clean by the Library's conservation staff and transferred to the public area on the ground floor where it may be seen by all. The bronze version is signed on the base: it looks as though Cassidy intended to write 'John Cassidy fecit 1905' but ran out of space and had to use 'sct' for 'sculpted' instead. Mrs Rylands died in Torquay, where she had made her home, on 4 February 1908, and is buried with her husband in Southern Cemetery, Manchester. The images on this page are included by kind permission of The John Rylands University Library's Heritage Imaging team, e-mail uml.chicc@manchester.ac.uk, and must not be reproduced without permission. Written by Charlie Hulme. Updated November 2015.